← Help Is a Click Away. Today is Memorial Day. We fly the flags at half staff or drape a black ribbon from them until noon to honor those Americans who have fallen on the fields of battle. Then the holiday weekend gives over to cook outs and time spent with the family. Today is also the unofficial start of the summer season. 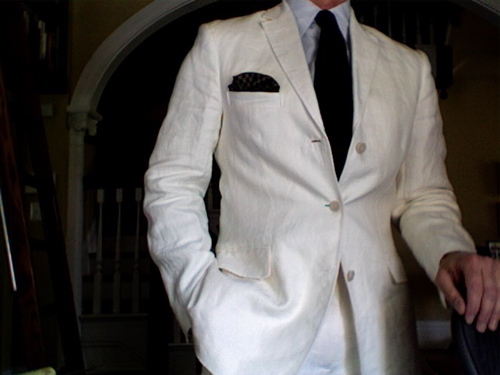 And your white linen suit (J. Crew); unless you are Tom Wolfe in which case it’s just an average day. Happy Memorial Day and thank you to those of you who have served and lost those in service to our country. 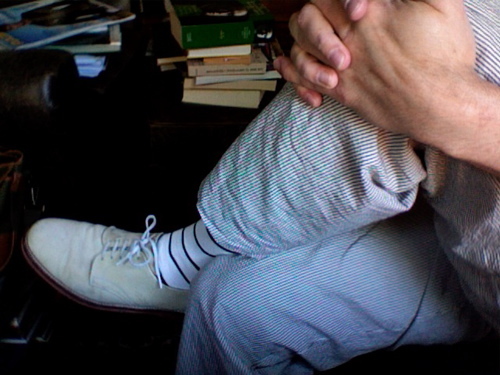 This entry was posted in Elegantology and tagged brooks brothers, Crockett and Jones, GQ, linen clothing, LL Bean, Memorial Day, Panama Hat, Polo, seersucker, Spectator shoes, White Bucks. Bookmark the permalink. And as happens on so many Memorial Days, the weather won’t co-operate. Thank you for the Memorial Day post Chris…I am thinking of my late husband and how wonderful he was. I saw the most dapper elderly black man downtown the other day. 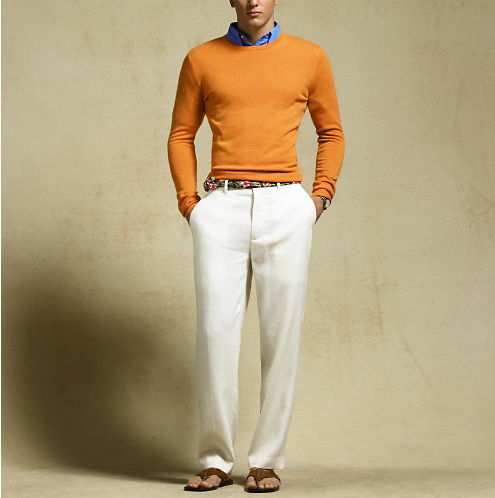 He was wearing a beautiful straw boater, blue blazer and white shirt and bermuda shorts. I was just delighted! I was also wondering about the architecture in the first photograph: it’s a bit wonky. Or are they standing in front of a very large photomural? Began the day by ironing our flag. Old Glory flies at our front door today–a lovely site as we descend the stairs, looking through a very long paned window on which ivy has begun to spread along the edges. I love Spectator anything–my mother wore spectator pumps in the ’50’s and ’60’s in both navy/ white and brown/white with everything. Very crisp and adorable on her (she was a cute size 6 with feet to match). My own dress choice for this Spring was a black and white Spectator dress–cotton pique with grosgrain ribbon trim, slightly raised waist, inverted front pleat, fully lined, sleeveless. Feminine, crisp, fresh, modern, yet completely classic. I will wear this dress for years to come. since I didn’t have time to shop for a shoe and didn’t want to spend the $$$ this Spring, I retrieved my Chanel Spectator low pump, from the late 80’s, in a beige/tan with black toe, classic little bow. Doesn’t matter what year I bought the shoe, it was the perfect choice and better than any new shoe could possibly be. Worn with stockings (Hanes/Pearl), a multi-strand pearl bracelet, and strands of mismatched pearls at my neck, an understated pearl w/diamond earring, and a small Knot bag (only large enough for two lipsticks and a hanky). My Spectator dress and shoe has served me well for a mother-daughter Deb brunch, our daughter’s h.s. graduation on the school lawn, a Spring gala which was informal, and our son’s college graduation (also outdoors) in June. I would always rather have one fabulous dress each season than four unremarkable ones. But a lady needs a good number of good shoes to work with. The nice thing about middle age is that you have accumulated a lot of good shoes! I laughed out loud at the Tom Wolfe comment! Thank you for an elegant summary of men’s summer highlights. 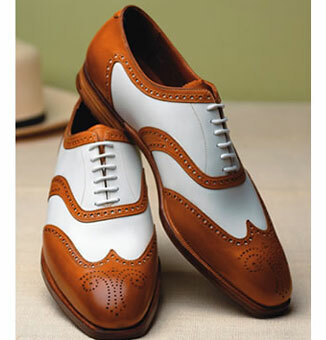 I love white but you really need to wear them in the country with more sun! In UK, I don’t know why it always rain when I decide to put my white on! Hi Bevglen, looks like a photo montage to me. 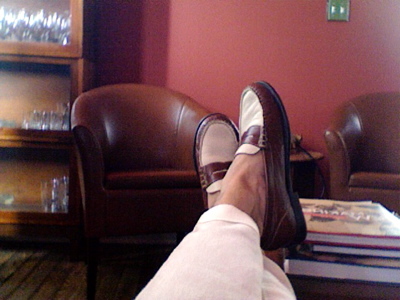 The loafers are by Martin Dingman. Very comfortable. Through Sierra Trading Post. Paula, a perfect outfit that will remain stylish for years and years. Although I have come to love seersucker, I think the lapels on the suit pictured are a wee narrow. Those C & J spectators are some of the nicest spectators (or co-respondents, as our English friends would have it) out there. I wish I could afford a pair! Welcome Brent. The C&J’s are very nicely done, agreed. I have a fondness for the narrow lapel as many of my first suits had been my father’s from the early sixties. 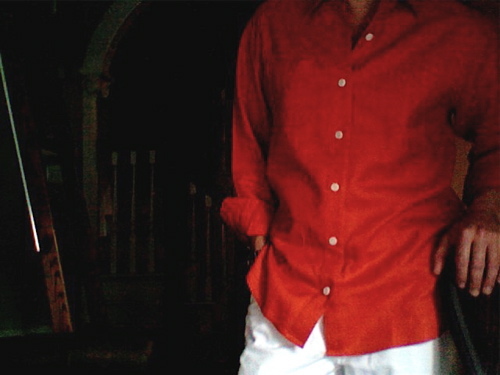 I had the smaller collared button downs and slim ties to match.